Three new stations - one of them a replacement - opened with the timetable change on December 13. Cranbrook, between Pinhoe and Whimple on the Exeter to London Waterloo main line, opened with the first train for Exeter St Davids at 0846, followed by the first service to Waterloo calling at 0939. There is an hourly service each way. The single-platform station, which serves a rapidly expanding new town development, has been subject to numerous delays since the original 2013 opening date was announced. Costing £4.5 million, it has been largely funded by Devon County Council (RAIL 693). In West Yorkshire, the long-awaited station at Apperley Bridge also opened on December 13, shortly after the Office of Rail and Road issued the safety certificate. The station will generally have a half-hourly service to Leeds and Bradford Forster Square (RAIL 789). Also in the area, the Leeds station Southern Entrance is very close to completion, while both Low Moor and Kirkstall Forge stations are due to open early in 2016. 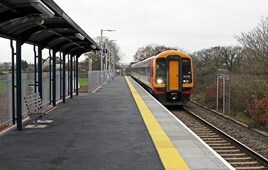 In Kent, the new station in Rochester also opened on the evening of December 13. This £26m facility is nearer to the city centre than the previous station, can accommodate 12-car trains, and will have additional services to and from London. The previous station, 500 metres to the east of the new one and built in 1892, is now closed. And finally, after an eight-month widening project, the 276-metre Farnworth Tunnel in Lancashire opened on December 14. The former single-track bore has been widened to accommodate two 100mph tracks, and given sufficient height to take the overhead electrification wiring that will soon be installed as part of the Manchester-Preston phase of the North West Electrification Programme. Cranbrook railway station would also serve nearby Exeter International Airport as well its own new town to be built in years to come. And with Farnworth Tunnel seeing the Northbound tunnel already rebuild and re-widened for overhead wiring electrification to be installed with 2 new tracks already been laid and trains can go past the tunnel at high speed as the line has a limit of 60-100mph. But the southbound tunnel which is now unused and due to be covered up permanently could be reused as a pedestrian tunnel with new lights to be installed and the southbound railway track & sleeper to be removed and to be replaced with new tarmac surface to create a new walking pathway for people to walk and cycling a bike underneath the former southbound railway tunnel as part of a new Northern Powerhouse scheme.